A big Wharfedale welcome to a much needed service! Whether you are a new parent, or a parent new to the Wharfedale area finding things to do, places to visit and services can be a difficult task. There are several websites that will offer you everything you need but can be a mine field to transverse, or are not specific enough to the Wharfedale area. Sarah is a Wharfedale local and passionate advocate of its lovely community. After having her son in 2011, Sarah was frustrated with the lack of One-stop shop services for parents in the area. Sarah eventually found the Harrogate mumbler and a daughter later, Sarah decided she needed to bring Mumbler to Wharfedale. So what is the Wharfedale Mumbler about? 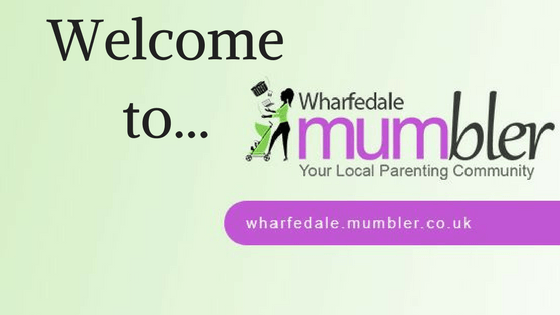 The basis of Wharfedale Mumbler is to offer a platform to mums (and dads) to locate local events such as baby clinics, groups and family friendly activities. There are lists of local playschools for those children not ready for school yet and for those in school there is also details about various after school activities. These include dance classes, swimming lessons, martial arts groups and so much more. The website is set up in such a way you can pick your free days and search for the activities on those days, with contact details, location, and times all noted. With the summer holidays coming up there is also a summer activities pack you can download, and featured holiday activities/camps available. At the moment, the events cater more towards children from birth to around 8 years old. However, Sarah is eager to learn more about activities for children over 8 years old. If you know of any in the area do visit the website or Facebook page and let her know. The Wharfedale Mumbler is not just for children, there is so much for parents too. If you need a break or looking for a bit of pampering, then the website has sections for these. For parents wanting to get engage in exercise (more than weight lifting all the children’s stuff around) there is adult fitness classes to search through as well. Money saving tips, from energy usage to meal planning and simple yet delicious recipes are provided for money conscientious parents. For job hunting parents, there are job listings, which are updated regularly so worth visiting often. Let’s not forget the expectant mothers, there is information on local pre-natal classes, pregnancy and labour support groups including details on local health visitors. On the 10th of June Wharfedale Mumbler went live and Sarah has been involved in many local family friendly (free) activities connecting with the families, offering information and something fun for the kids. With the help of local families, as well as activity providers and local businesses she hopes to develop and grow the Wharfedale Mumbler. Her aim is to incorporate all ages, provide more details about local schools including their Ofsted reports and bring special offers to parents – all in one location. Besides the website there is a Facebook page you can follow to receive events and information direct and a Facebook group for parents to ask questions, offer support and get to know one another. We look forward to seeing the growth of such a fantastic service in the Wharfedale area, and hope you can support her by following and contributing to the Wharfedale Mumbler. We wish Sarah all the best of luck with her endeavour.